Let's put some context to a news release statement. Conservative MP Michelle Rempel stands during question period in the House of Commons on Parliament Hill in Ottawa on May 9, 2018. OTTAWA — "Trudeau and other politicians must realize the real-life consequences of their words when it comes to immigration. It is not compassionate nor prudent to give these individuals false hope when we know that the majority of the asylum claims before the Immigration and Refugee Board will eventually be rejected.'' — Conservative MP Michelle Rempel. 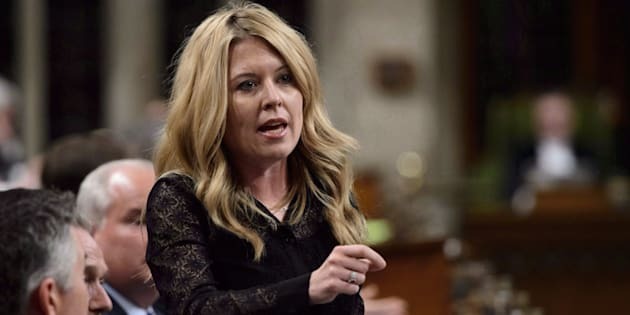 Michelle Rempel, the official Opposition's immigration critic, issued a news release earlier this week criticizing the Trudeau government's handling of the ongoing influx of so-called "irregular'' migrants coming across the Canada-U.S. border. Public Safety Minsiter Ralph Goodale discusses the situation of irregular migration as Immigration Minister Ahmed Hussen and Transport Minister Marc Garneau, Minister of Transport look on during a news conference on May 7, 2018 near Hemmingford, Que. Canada began experiencing an influx of "irregular'' border crossers in early 2017, shortly after U.S. President Donald Trump announced he would end a program that offered temporary protected status to immigrants from several countries, including Haiti, to live in the United States. Thousands of asylum seekers have since arrived in Canada from the U.S., avoiding official border checkpoints where they'd have been turned away under the Safe Third Country agreement between the two countries. Instead, they've been crossing the border along forest paths and fields, declaring their intent to seek refugee status once on Canadian soil. After Garneau made the statement in May that more than 90 per cent of irregular migrants were being rejected, government officials later clarified that he was referring specifically to the number of Haitians who crossed into Canada last year at unofficial crossings. The majority of asylum seekers this year are Nigerian, and as a result may be more eligible for asylum, given the state of conflict and persecution of certain populations in Nigeria, the government has said. IRB data shows that between February 2017 and March 2018, 68 per cent of claims by asylum seekers from Haiti whose claims had been processed were rejected, while only nine per cent were approved. Meanwhile, 46 per cent of Nigerian claims were rejected and 33 per cent were accepted. Only a small percentage of the total claims have been processed so far, due to a significant backlog at the IRB. Only 1,074 Haitian claims and 361 claims from Nigerians have been completed. The numbers would seem to suggest that overall, more irregular asylum seekers are being accepted than rejected and that Nigerians are having a higher success rate than Haitians. But Janet Dench of the Canadian Council for Refugees warns against extrapolating any trends from such limited data. Not only is the sample size too small, certain claims are being prioritized by the IRB for processing for a variety of reasons. Therefore, those that have been processed to date may not represent the overall population of those still awaiting an outcome, Dench said. A family, claiming to be from Columbia, is arrested by RCMP officers as they cross the border into Canada from the United States as asylum seekers on April 18, 2018 near Champlain, N.Y.
Long wait times can also prompt some asylum seekers to abandon their claims — particularly those in vulnerable situations, which can also skew the numbers, Dench added. Sharry Aiken, a refugee law professor at Queen's University, says she also believes it's impossible to say definitively whether a majority of irregular claims will be rejected. Each individual claimant may face different risks based on their race, gender, political affiliation or sexual orientation if they're rejected and sent back to their home countries, Aiken said. That level of risk is weighed during the IRB hearing process. "It's not really possible to offer sweeping conclusions about the prospects of either Haitian nationals or Nigerian nationals without knowing more about the individual issues, because ultimately the decision does come down to the individual circumstances and the individuated risk they would face on return,'' she said.